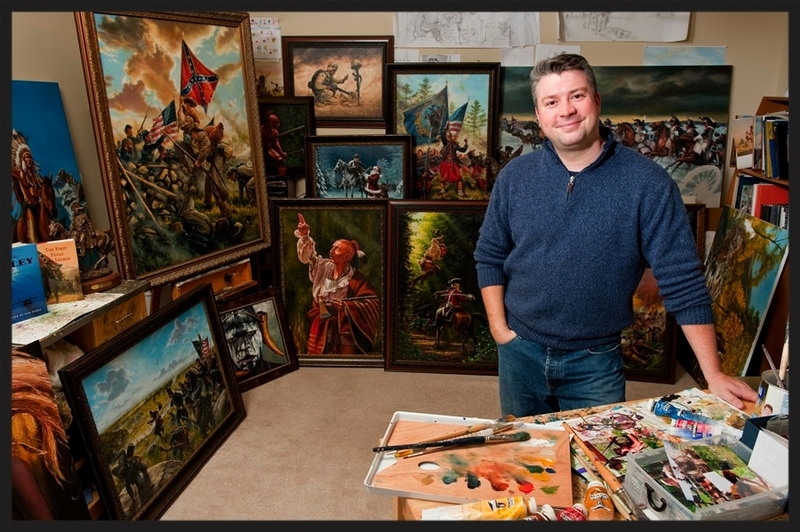 Dan Nance, a native Carolinian, has been fascinated with history all his life. Coming from a rich and storied heritage, he developed a passion for history from an early age. Visiting American Civil War battlefields instilled not only a deep respect, but an even deeper desire to tell those stories, both famous and anonymous. By honing his natural artistic talent and synthesizing that with his love for dramatic cinema, Nance was able to interpret what he saw and read to create profound images of American history. Winning a full scholarship to prestigious New York art school, Pratt Institute, Nance majored in film while publishing his first fine art print at the young age of nineteen. There, he began to create his hallmark perspective… painted images that seem lifted from a perfect frame of film from a movie that took place more than a century ago. During his twenty years career, Nance has released over two dozen prints and graced numerous book and magazine covers, growing a wide audience of authoritative scholars and historical interpreters who respect his integrity, as well as faithful patrons and enthusiasts who love his action-packed and emotional portrayals of our past. · The South Carolina State Museum and Confederate relic room. Charlotte, NC has placed two of the artist's historical works on Granite monuments Uptown commemorating the history of the Queen City. All rights reserved and copy written by the Artist.